To be sure, “The Simpsons” (Fox, 8 p.m.) is one of his favorite shows, but the sheer popularity of Apu, the extreme accent and heavy dose of stereotype it used, gnawed at him. Not to mention that it was voiced for maximum stereotype, by his own admission, by a white voice actor, Hank Azaria. Kondabolu’s obsession led to his short documentary “The Problem with Apu” (truTV, 10 p.m.) in which he trades ideas with other South Asian actors who have had to deal with Apu fallout: from catchphrases being flung at them to the array of stereotypes that have been extended by the character over dozens of seasons. Some of them, such as Kal Penn, have vowed hatred for “The Simpsons” for the Apu thing alone. Others, like Assif Mandvi, say it’s the result of there being a lack of other prominent South Asians seen on TV at least until recently, with the success of Aziz Ansari and Hasan Minhaj, who are in the film and Mindy Kahling, who is not. Also prominently not in the film is Azaria himself, an affront that begins to consume the film, as we see the filmmaker spend time writing emails and leaving messages for him. There is some footage of him explaining the development of the character, though, from other sources, however, so it’s not as if his view is not represented. Dana Gould is alone among “The Simpsons” staff to respond to the criticism. Executive producer Al Jean isn’t in the film, but I asked him about the documentary when I saw him at a Fox party last summer. “We had an episode that dealt with it,” Jean said. 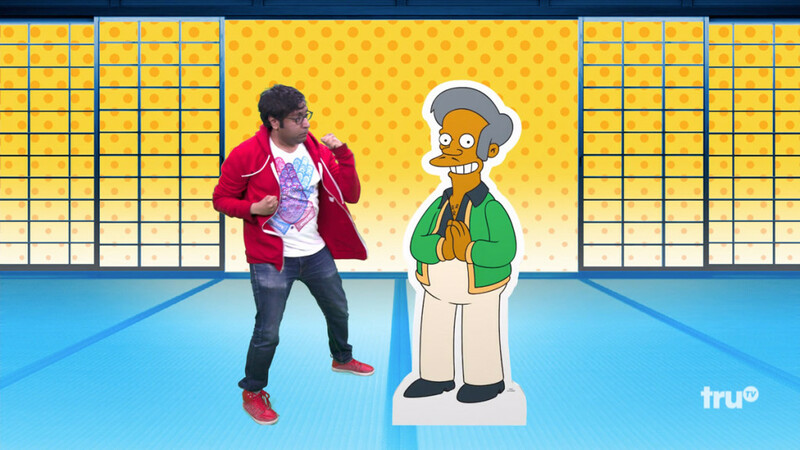 Referring to an episode in which Apu’s (non-accented) nephew comes to town and chews out Apu for his stereotypical ways, it was voiced by Utkarsh Ambudkar, who appears in “The Problem with Apu” as one of the staunchest critics. The film is an interesting door to a useful discussion about portrayals of people on TV, especially immigrants, though it never solves the problem. This entry was posted in Summer Press Tour 2017, What's On TV. Bookmark the permalink. Both comments and trackbacks are currently closed.